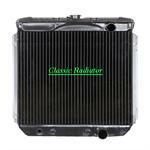 We carry radiators for many vintage Ford models like the Galaxie, Fairlane, & Mustang. 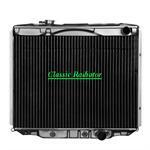 Shop for classic Ford radiators. Copper radiators for your classic Ford car, truck, hot rod or street rod. Shop online for vintage Ford copper radiators. View Inventory. 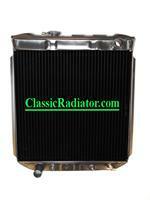 Shop for Griffin aluminum radiators for Classic Ford cars. 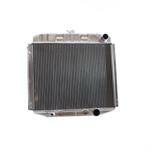 Find radiators for the Ford Galaxie, Mustang and other vintage Ford models. This radiator has 2 rows of 1" tubes on 3/8" centers. The core size is 16" tall and 24" wide. It fits 68 to 70 Mustangs and Cougars with the saddle mount style radiator and the lower neck on the driver side. It does not have a trans cooler.